UPDATE: In the center of 2012, I reached the 1000 different cans!! * Why I start collecting energy drinks? 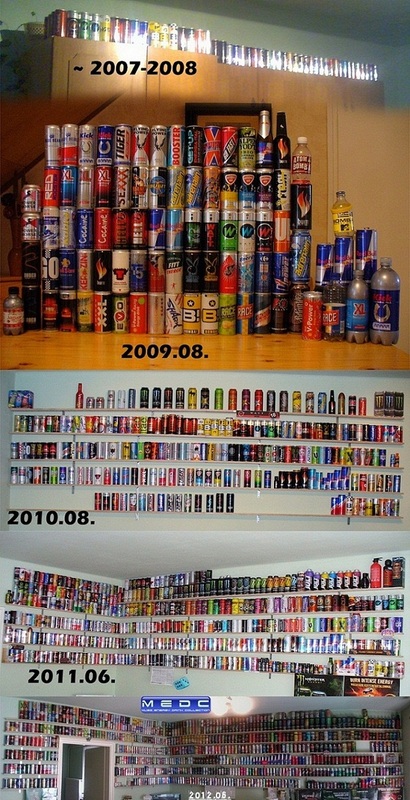 In 2007, I drink much energy drinks, and collect the cans in a big tower, but its have same cans, maybe 10 different, but 60-70 cans... Later, I moved into an other room, into the present one, and I wanted to throw it out all cans, but I thinking, and I'm kept the different ones and I strat to collect the different cans... That you see on the first picture at 2007-2008.